The Nature Conservancy is working with leading coastal scientists and community partners to explore and document the resilience inherent to the Virginia Eastern Shore’s natural ecosystems. We are using this living laboratory to better understand how nature can make coastal communities here—and everywhere—more resilient in the face of a changing climate. This information is being incorporated into the Coastal Resilience decision support tool customized for the Virginia Eastern Shore, providing local governments with the information they need to better plan for the future. Learn how to use each of the tool’s applications (or apps) in the sections below. Each section includes a short introductory video, a step-by-step tutorial, and a 2-page fact-sheet about each app. The Flood and Sea Level Rise app shows the potential future risk of inundation and flooding due to sea-level rise and storm surge on towns, homes, properties, and critical built infrastructure like roads and utilities, as well as coastal habitats. The Basic Inundation module shows how water levels are projected to change under various sea-level rise scenarios using data customized for Virginia’s Eastern Shore. The Storm Surge module shows the potential effects of sea-level rise on wind- and wave-driven storm surge. Read the Flood and Sea Level Rise app fact sheet for additional details about what the app is, who should use it, and how it works. The Coastline Change app demonstrates the dynamic nature of barrier islands over time. The Historical Data module allows users to view the geographic location of past ocean shorelines and the calculated change rates for shorelines over short- and longer-term timeframes. The Future Scenarios module provides results from a modeling effort that allows users to explore how climate change combined with management actions over a 50-year time frame may affect rates of shoreline change in the future along a simulated Virginia barrier island system. Watch this 90-second video to get a brief introduction about the Coastline Change app functionalities. Take this step-by-step tutorial to learn how to use both the Historical Data and Future Scenarios modules of the Coastline Change app. Read the Coastline Change app- Future Scenarios fact sheet to learn the details about what the app is, who should use it, and how it works. Read the Coastline Change app- Historical module fact sheet to learn the details about what the app is, who should use it, and how it works. The Living Shoreline Explorer app shows suitability for living shorelines, along with a marsh vulnerability index. The Living Shoreline Explorer model considers conditions suitable for marsh vegetation enhancement, or marsh enhancement with structures (e.g., rock or oyster sill). The Marsh Vulnerability Index Model shows the vulnerability of tidal salt marshes to erosion and inundation. Watch this 90-second video to get a brief introduction about the Living Shoreline app functionalities. Take this step-by-step tutorial to learn how to use the Living Shoreline app. Read the Living Shoreline Explorer app fact sheet to learn the details about what the app is, who should use it, and how it works. Watch this 90-second video to get a brief introduction about the Future Habitat app functionalities. Take this step-by-step tutorial to learn how to use the Future Habitat app. Read the Future Habitat fact sheet to learn the details about what the app is, who should use it, and how it works. 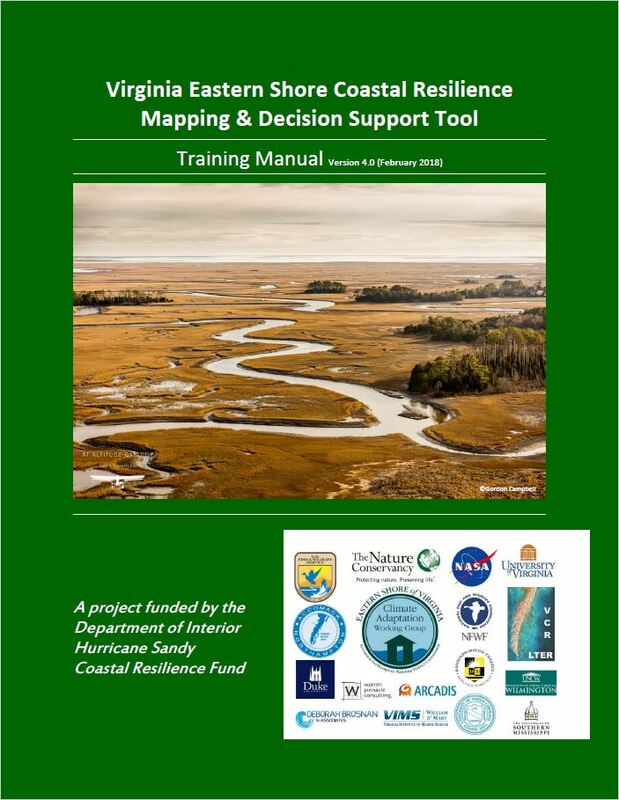 Read the training manual for the Virginia Eastern Shore Coastal Resilience Mapping and Decision Support Tool.